Two weeks to go: Time to push out all the details here (Engl., Nederl., 日本語). First of all – the poster! If you know any venue where I can put it, or want a bucket of flyers, please let me know. Gotta get the word out. There is an opening on the 2nd of March with talks by each of us three artists (limited seats). You can also see the exhibition all through March. “Kyoto – Amsterdam exchange exposition” poster. Following are description and details in English, Dutch and Japanese. 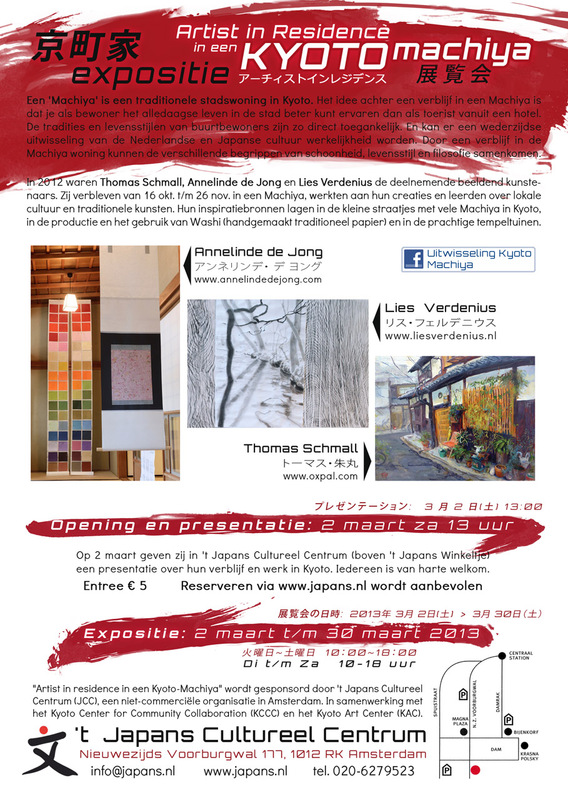 On March 2 the artists are giving a presentation at the Japans Cultureel Centrum about their stay and work in Kyoto. Everyone is welcome to join. Admission for the presentation: € 5. 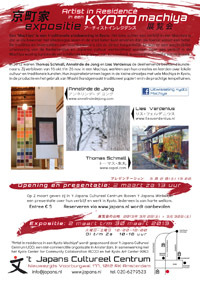 There are limited seats, so reserving via www.japans.nl is advised. Machiya are the traditional wooden houses in Kyoto. A unique mix of merchant/artisan and living space. The idea to let artists from the Netherlands stay in such a house, is to let them experience the everyday live of the city more direct than when staying in a hotel. 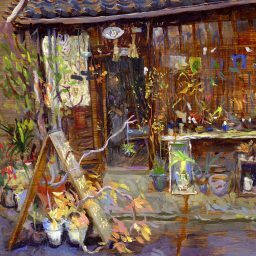 Seeing the traditions and way of life of the neighbors directly, allows a direct exchange between the Dutch and Japanese cultures. At the end of 2012 Thomas Schmall, Annelinde de Jong and Lies Verdenius took part in this residence program. They stayed from mid-October until the end of November – working on artworks, installations and learning about the local culture and craftsmanship. The specific inspirations during this stay came from the small streets with many of the Machiya, the production and use of Washi (like the Washi-making, a handmade paper that is made since more than a thousand years) and the impressive temple gardens. Een ‘Machiya’ is een traditionele stadswoning in Kyoto. Het idee achter een verblijf in een Machiya is dat je als bewoner het alledaagse leven in de stad beter kunt ervaren dan als toerist vanuit een hotel. De tradities en levensstijlen van buurtbewoners zijn zo direct toegankelijk. En kan er een wederzijdse uitwisseling van de Nederlandse en Japanse cultuur werkelijkheid worden. Door een verblijf in de Machiya woning kunnen de verschillende begrippen van schoonheid, levensstijl en filosofie samenkomen. In 2012 waren Thomas Schmall, Annelinde de Jong en Lies Verdenius de deelnemende beeldend kunstenaars. Zij verbleven van 16 okt. t/m 26 nov. in een Machiya, werkten aan hun creaties en leerden over lokale cultuur en traditionele kunsten. Hun inspiratiebronnen lagen in de kleine straatjes met vele Machiya in Kyoto, in de productie en het gebruik van Washi (handgemaakt traditioneel papier) en in de prachtige tempeltuinen. 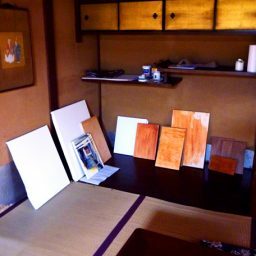 “Artist in residence in een Kyoto-Machiya” wordt gesponsord door ‘t Japans Cultureel Centrum (JCC), een niet-commerciële organisatie in Amsterdam. In samenwerking met het Kyoto Center for Community Collaboration (KCCC) en het Kyoto Art Center (KAC). Artworks from each of us.